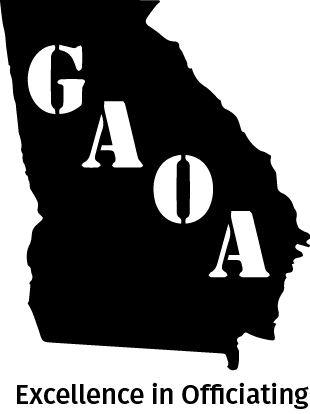 You must be on the roster of a GISA and GICAA officiating organization to qualify for a GAOA Membership Card. Valid photo ID is required to gain entry to a contest using the GAOA Membership Card. The GAOA Membership Card cannot be used by anyone except the person named on the front of the card. Those found violating GAOA Membership Card Rules will have their cards taken and returned to the GAOA. These individuals will lose GAOA Membership rights. Street address only - not city or state. -- Select Association -- Elite Officials Association Peach State Track & Field Albany Baseball Atlanta Baseball Atlanta Quarterback Baseball Augusta Baseball Capitol City Baseball Central Georgia Baseball Chattahoochee Baseball Umpires Columbus Baseball Deep South Baseball Diamond Baseball Emerald City Baseball Flint River Baseball Gold Coast Baseball Greater Savannah Area Baseball Heritage Baseball Hinesville Baseball Houston Baseball Lanier Baseball Marietta Baseball Middle Georgia Baseball Multi-Co. Baseball Ngaoa Baseball Northeast Ga Baseball Rome Baseball South Georgia Baseball Southern Crescent Umpires Sports Officials Baseball Statesboro Baseball Tara Baseball Troup Baseball West Georgia Baseball Albany Volleyball Athens Volleyball Atlanta Area Volleyball Augusta Volleyball Columbus Area Volleyball Gold Coast Volleyball Greater GA Metro Volleyball Hinesville Volleyball Rome Volleyball Savannah Volleyball All South Wrestling Augusta Area Wrestling Coastal Wrestling Columbus Wrestling Georgia Wrestling Metro Atlanta Wrestling Mid. State Wrestling Rome Area Wrestling Southeast Georgia Wrestling Sports Officials Wrestling All Star Football Atlanta Area Basketball Atlanta Quarterback Basketball Augusta Basketball Capitol City Basketball Chattahoochee Basketball Cherokee Basketball Columbus Basketball Georgia Mountain Basketball Gold Coast Basketball Greater Georgia Basketball Hinesville Officials Metropolitan Basketball Middle Georgia Basketball Multi Co. Basketball North Ga Basketball Northeast GA Basketball Northwest GA Basketball Oconee Basketball Peach State Basketball Savannah Basketball South Georgia Basketball Southeastern Officials Southern Area Basketball Southern Basketball Sowega Basketball Warner Robins Basketball Warner Robins Football Metro-Atlanta Cheerleading Middle Georgia Cheerleading Northwest Ga Cheerleading South Georgia Cheerleading Southwest GA Cheerleading Atlanta Area Football Atlanta Peachstate Football Atlanta Quarterback Football Augusta Football Capitol City Football Coastal Football Officials Columbus Football Emerald City Football Etowah Valley Football Georgia Officials Athletic GFOA Football Gold Coast Football Gold Leaf Football Hinesville Officials Assn Icfoa Football Lanier Football Middle Georgia Football Multi Co. Football Northeast Ga Football Northwest Ga Football Southern Football Assn. West Georgia Football GA Girls Gymnastics Atlanta Peachstate Lacrosse GA Lacrosse Officials GA Womens Lacrosse Georgia Officials Athletic Assoc. Columbus Soccer Etowah Valley Soccer Georgia Soccer Golden Isles Soccer Greater Augusta Soccer Greater Savannah Soccer Heart Of Georgia Soccer Hinesville Soccer Northwest GA Soccer South Georgia Soccer Southeastern Soccer Southwest Georgia Soccer Tri-Rivers Soccer Officials Troup County Soccer Albany Softball Atlanta Quarterback Softball Augusta Softball Capitol City Softball Central Georgia Softball Chattahoochee Softball Columbus Softball Dalton Softball Deep South Softball Diamond Softball Emerald City Softball Flint River Softball Greater Georgia Softball Greater Savannah Area Heritage Softball High School Softball Hinesville Softball Houston County Softball Lanier Softball Middle Georgia Softball Multi Co. Softball Ngaoa Softball North GA Amateur Softball North Metro Softball Northeast GA Softball Rome Softball Softball Umpires Unlimited South Georgia Softball Statesboro Softball Tara Softball Troup Softball Vidalia-Toombs Softball Warner Robins Umpires West Georgia Softball Albany Swimming Augusta Area Swim & Dive Coastal Empire Swimming GA Interscholastic Swimming Metro Swim/Dive Rome Swimming Applicants not found on the roster of a GISA and GICAA officiating organization will receive neither a card nor a refund. Warning! Your Card Will Not Be Mailed! Warning! If you provide your full name in ALL CAPS, your card will not be mailed and you will not receive a refund. Applications that are improperly capitalized will not be approved. Warning! Individual Membership Cards will be mailed to the Association for distribution.